And end of an era. A longtime staple in the torrent world, Isohunt has been ordered by a U.S. judge to take down all torrents containing copyright infringing data at the request of the Motion Picture Association of America. 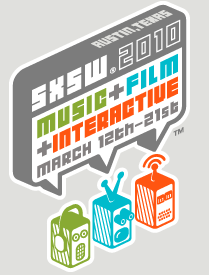 SXSW is an annual festival that showcases up and coming artists hoping to draw new audiences, most prominently in music and film. In 2005, the festival started to put out a free batch of music showcasing one song from every band in the festival (only the ones who’ve consented, of course). They’ve stopped doing this after 2008, but a few fans have continued the free music movement and created their own page of torrents dedicated to the festival’s wide variety of music. Some of the bands are definitely worth a look. However, d/l-er beware: I downloaded 2008’s batch 2 years ago and have still yet to filter to all the bad music. 5GB of music is a LOT.